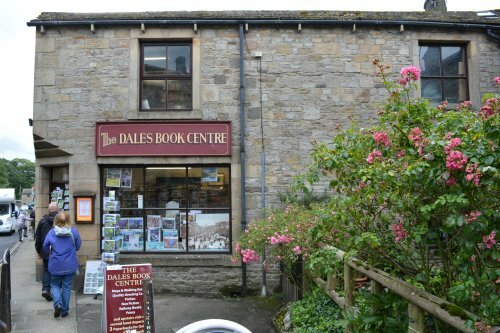 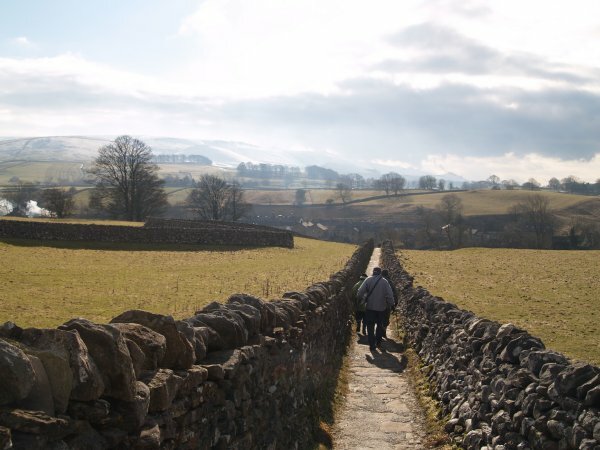 Ramble-ramblers-rambling-walks-walking-footpaths-bridleways: The route illustrated below is described in detail as Walk 15 THE HEART OF WHARFEDALE in Jack Keighley's walking book WALKS in DALES COUNTRY. 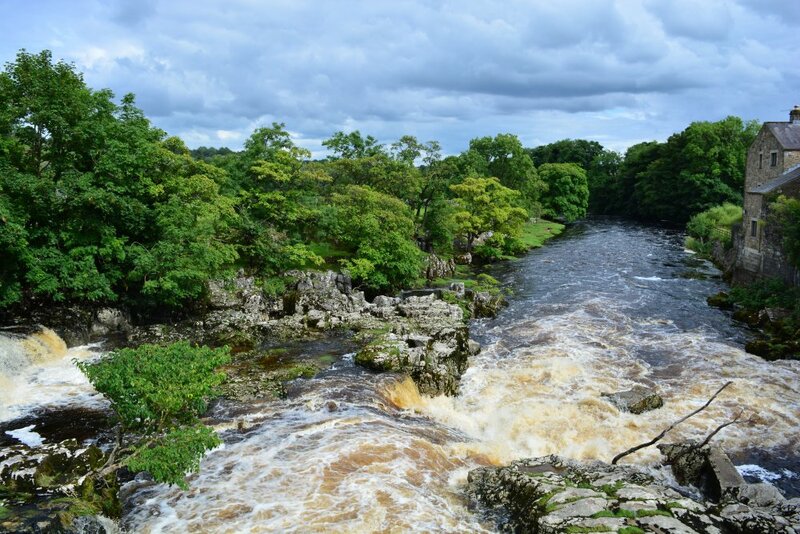 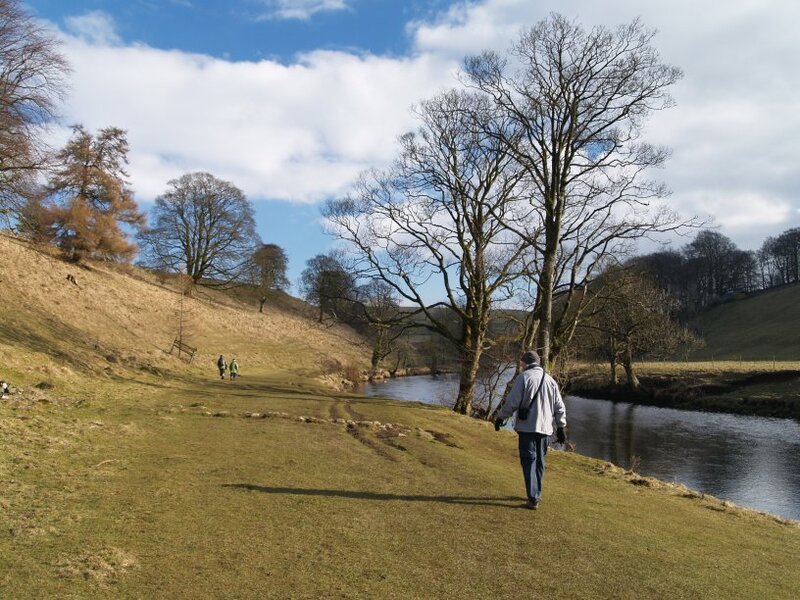 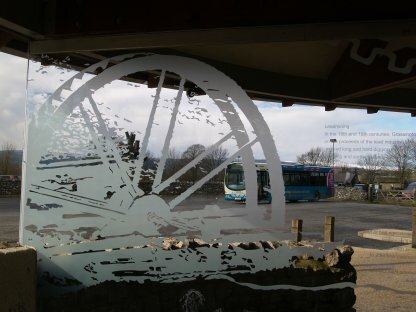 The route can be summarised as follows: Head down to the River Wharfe from the car park of Grassington National Park Centre. 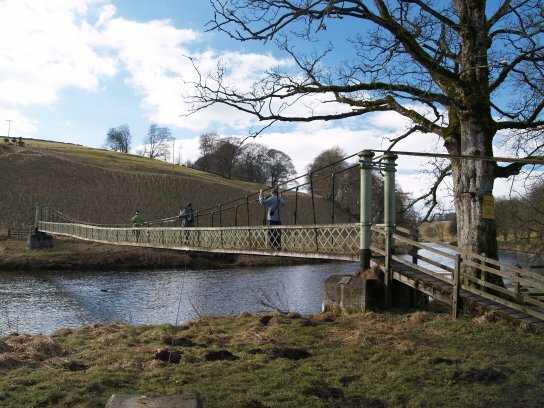 Walk east along the north river bank to the suspension bridge, cross river and head south for Badger Lane. 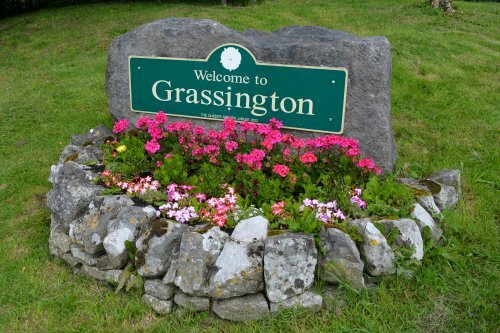 Turn right, heading west for the tiny village of Thorpe. 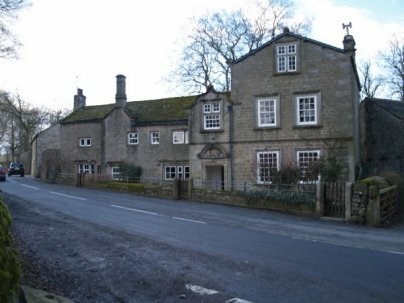 Continue west below Elbolton Hill to Far Langerton Cottage. 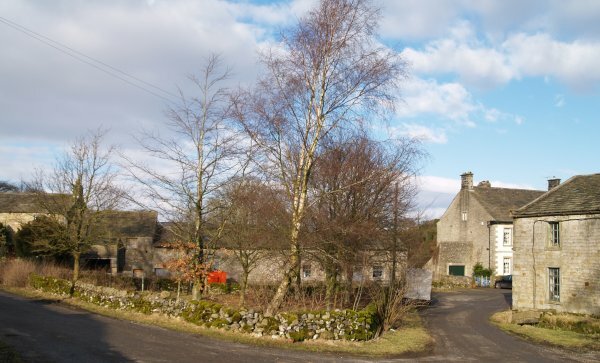 Head north down the road curving round to below Ings House. 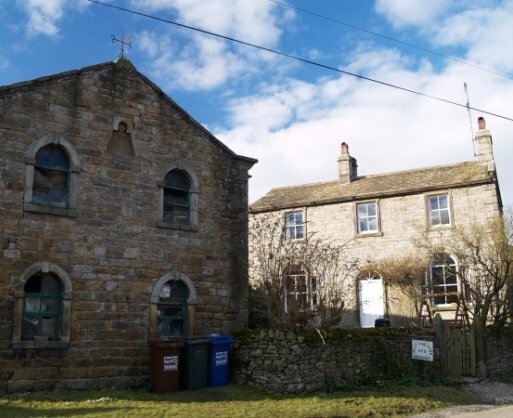 Turn right by a barn and head across the fields to Linton Village and then by road to the Church of St Michael and All Angels on the banks of the River Wharfe. 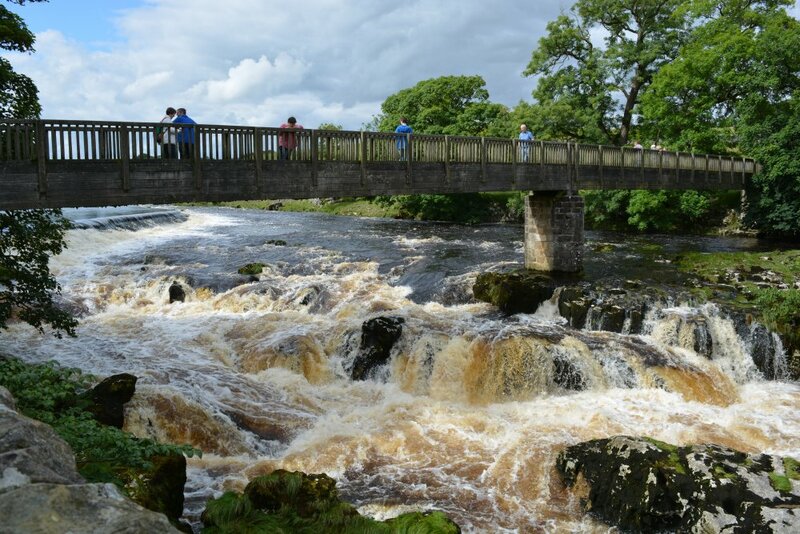 You then head west for a short distance before crossing the footbridge by the weirs and Linton Falls to return into Grassington. 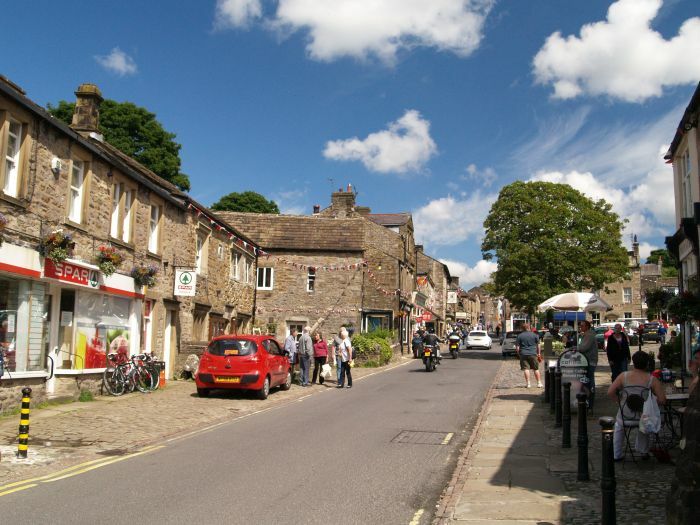 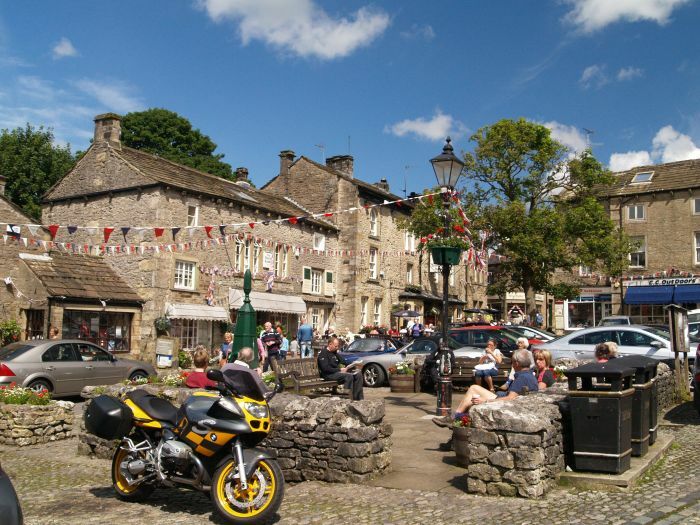 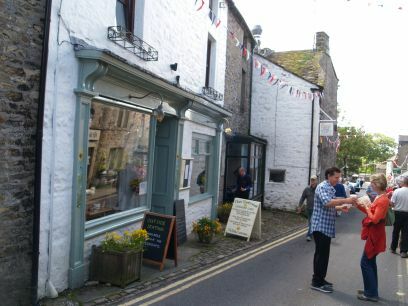 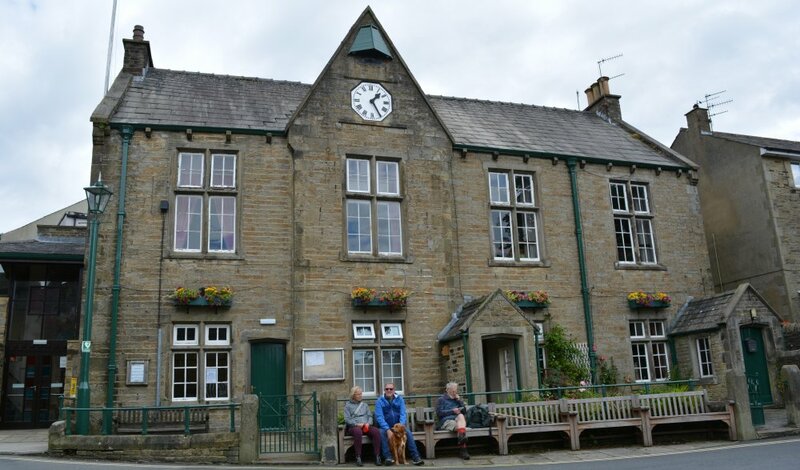 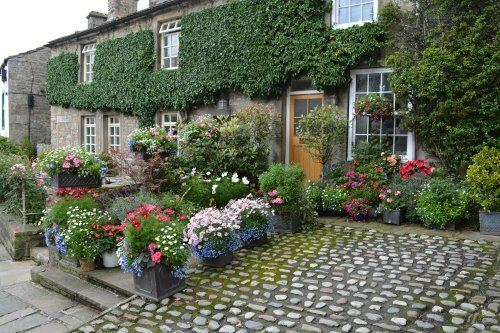 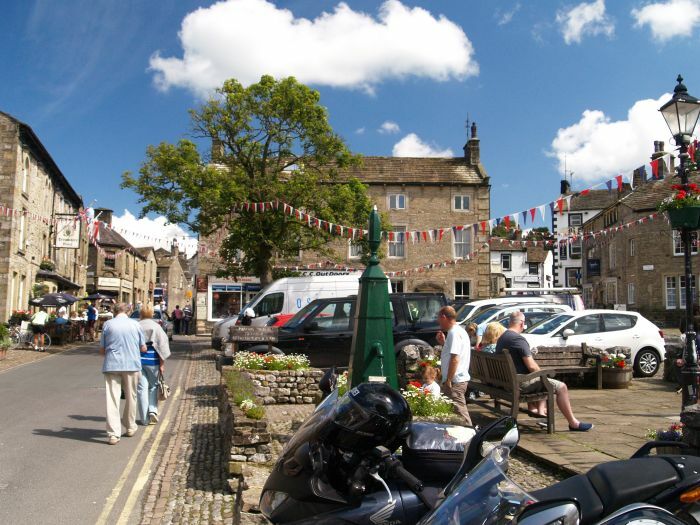 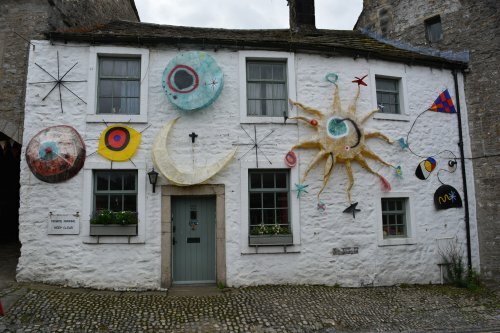 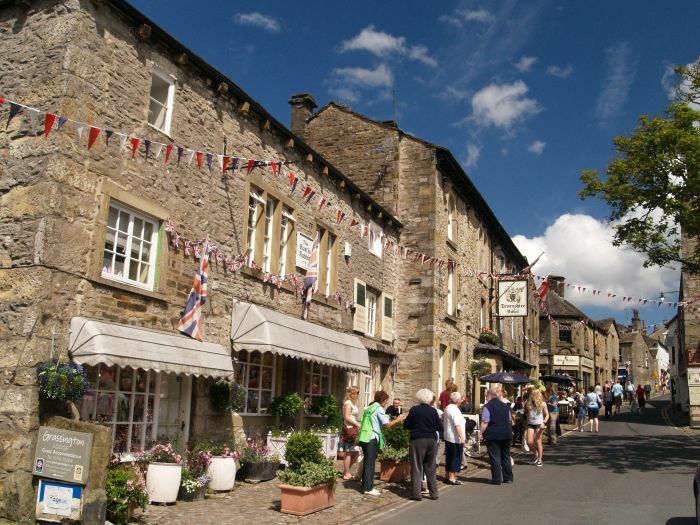 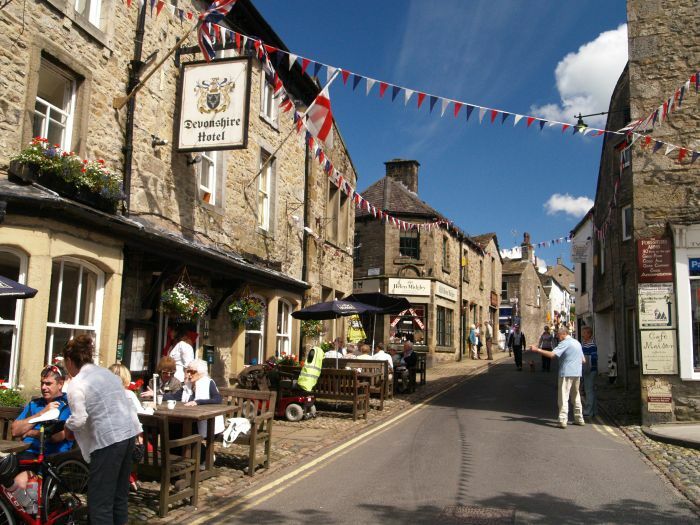 The centre of Grassington Village. 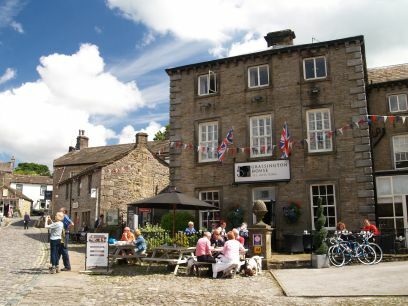 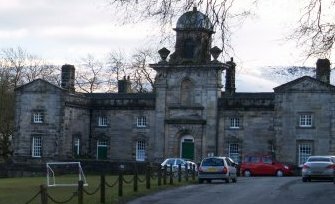 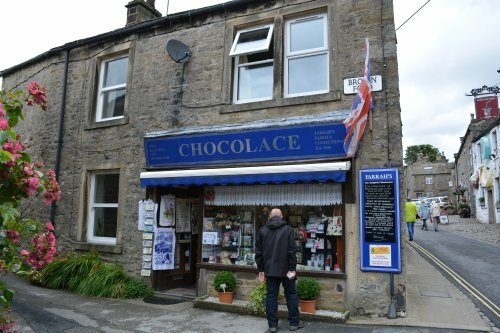 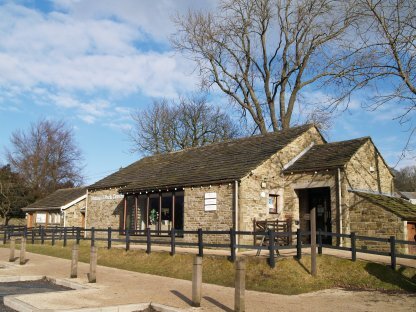 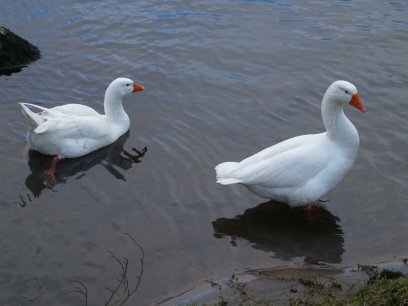 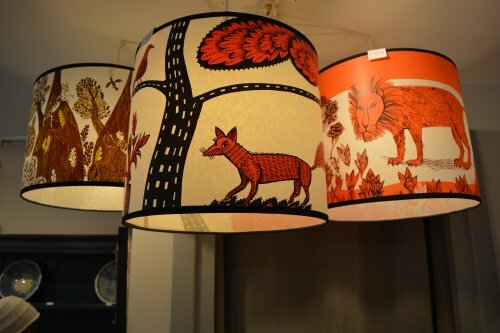 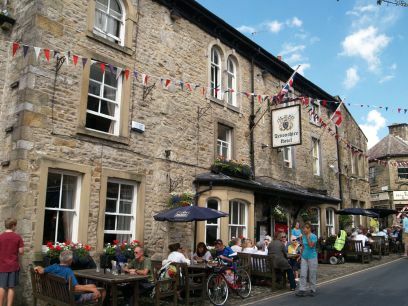 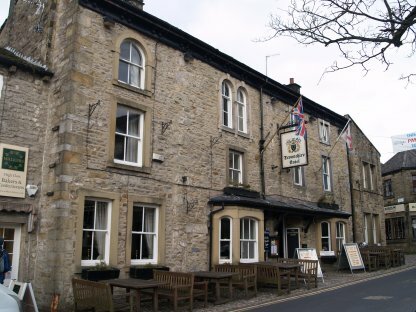 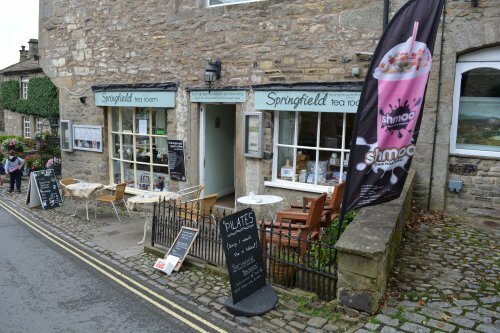 In the Main Street, good refreshment can be obtained at the Devonshire Hotel (good pub-bar meals) and The Retreat cafe which supports animal welfare. 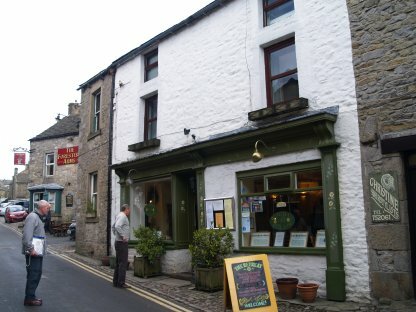 Church House, Grassington, dated 1694 over the door. 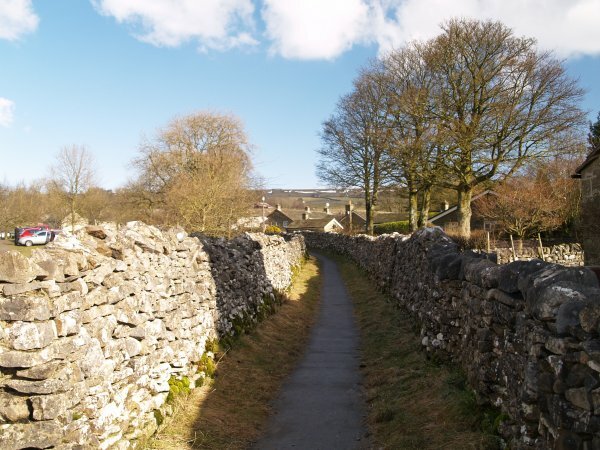 The double walled Sedber Lane, the path heading down to the River Wharfe. 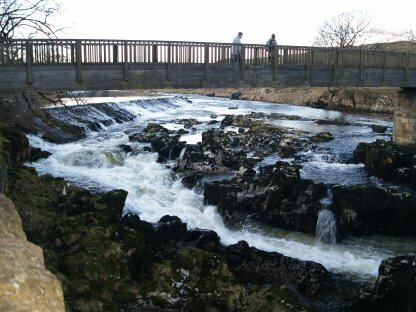 The weir systems of the River Wharfe at Grassington that once help feed water to the mills. 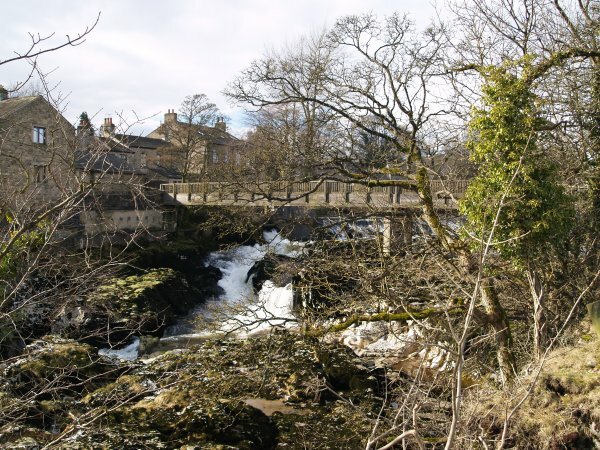 Linton Falls and the footbridge connecting Linton and Grassington. 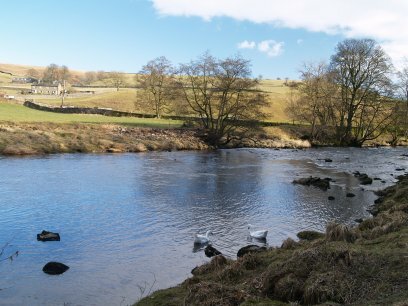 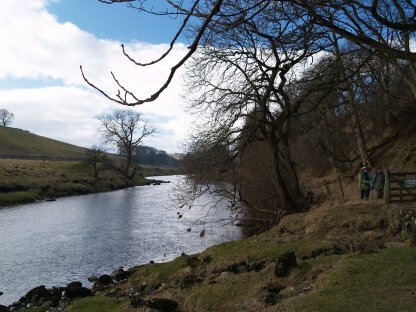 The bank of the River Wharfe, which here, is part of the Dales Way. 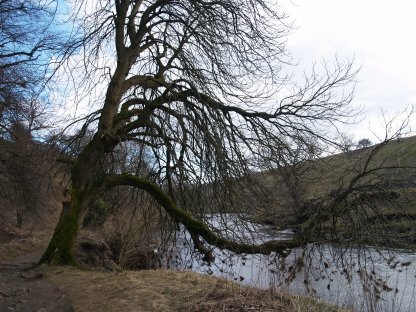 The north bank of the River Wharfe near Grassington, lovely trees above the river. 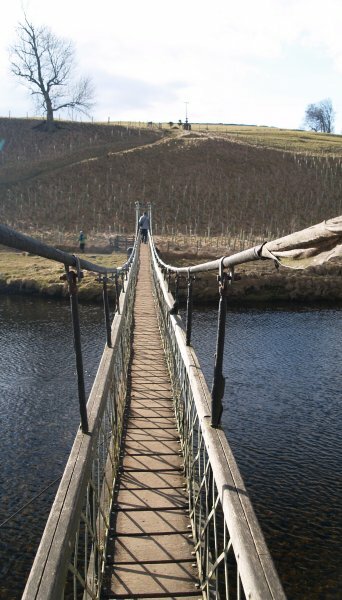 The suspension bridge was built in 1885 by a local blacksmith - sways a little, but otherwise, very sturdy! 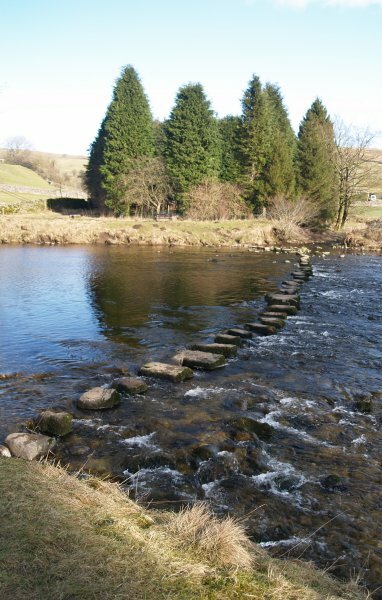 The obsolete stepping stones near the suspension bridge. 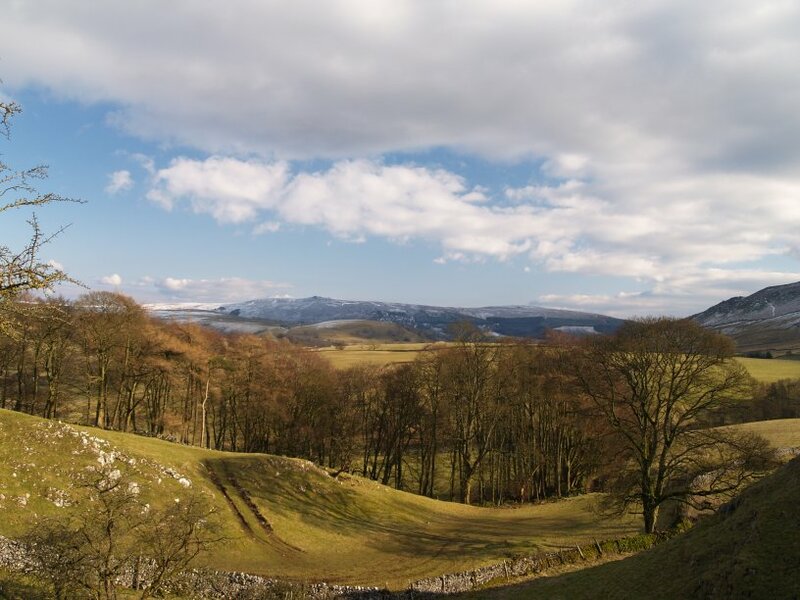 Looking east to snow-capped hills. 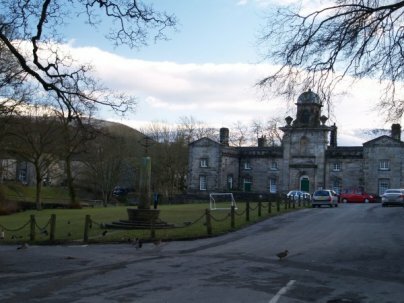 Looking north down Badger Lane. 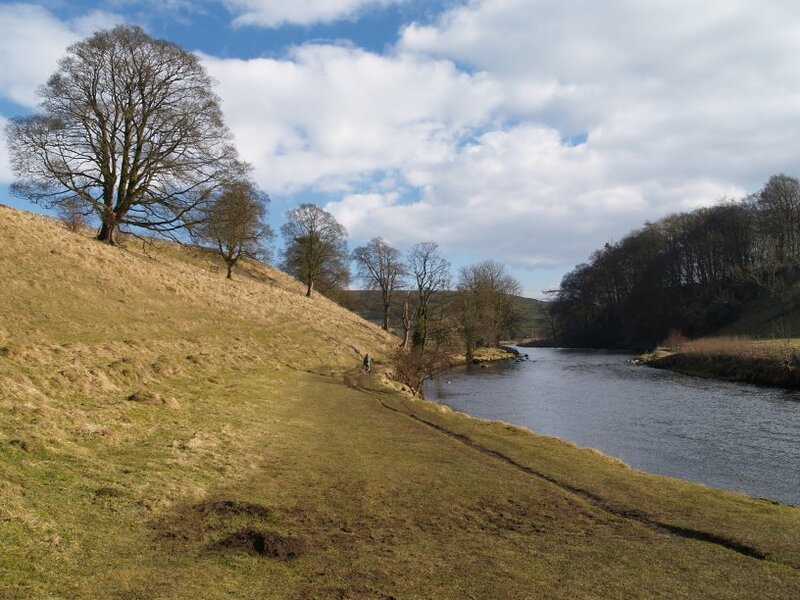 Ancient cultivation terraces (bottom left and centre). 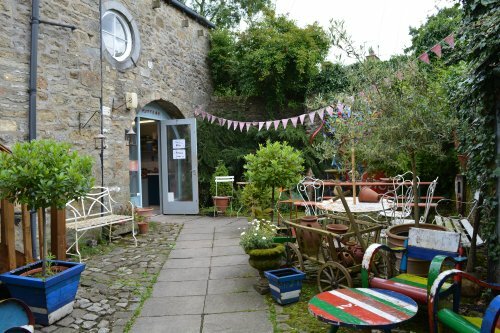 The barns at Tennant Lathe. 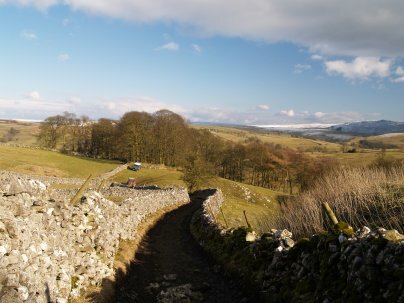 Looking west from Skulberts Hill. 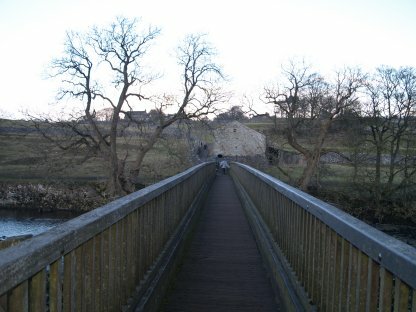 Climbing the double walled track to drop down into the tiny village of Thorpe. 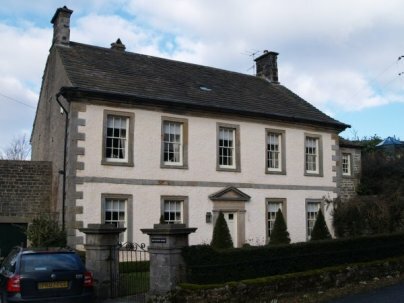 The restored fine looking Georgian Manor House and a sturdy stone entrance to a barn/garage? 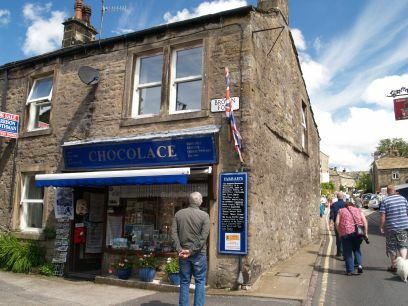 in Thorpe Village. 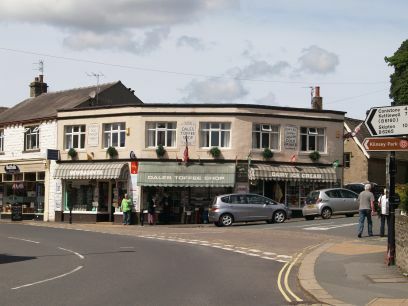 The centre of Thorpe, which once had a thriving shoe-boot industry. 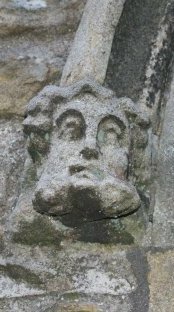 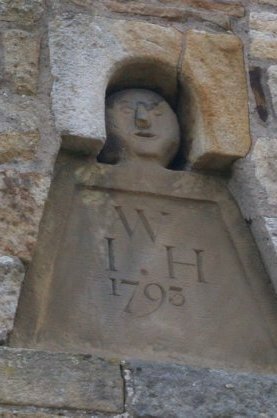 A curious carved stone head dated 1795 with the initials W I H high up on the side of an old chapel in Thorpe. 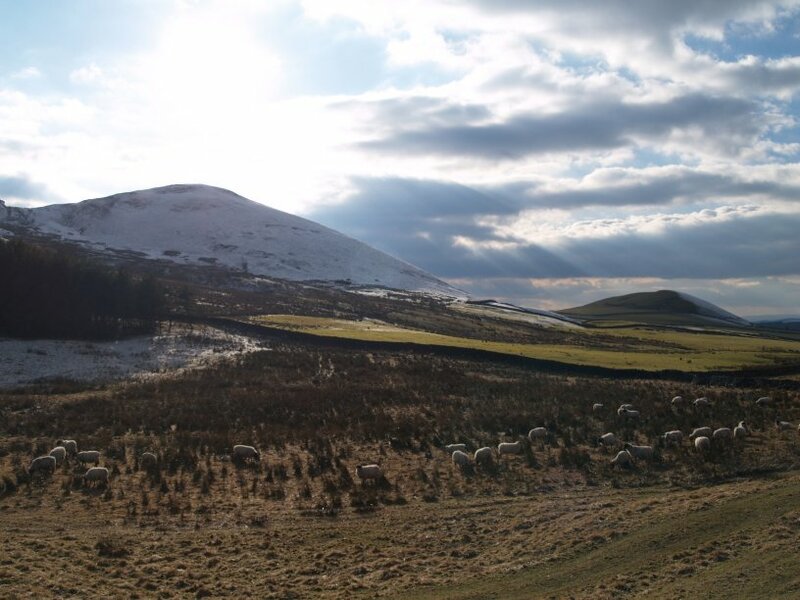 The sheep 'glinting' in the late afternoon sunlight. 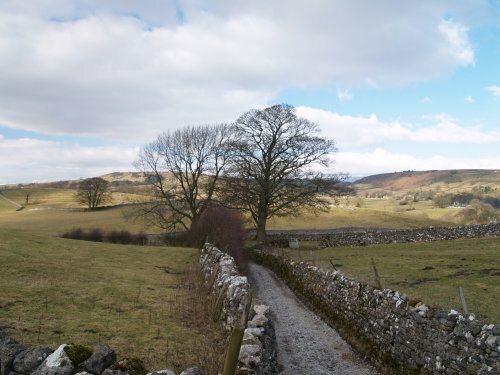 In the distance are the two reef knolls, Stebden Hill (left) and Butter Haw (right). 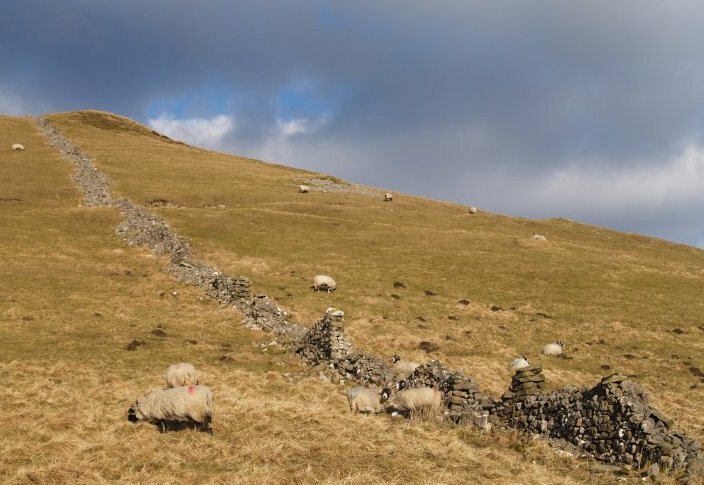 Reef knolls are smooth rounded hills of almost pure limestone formed from skeletons and shells of marine life that once lived in a rich shallow seas. 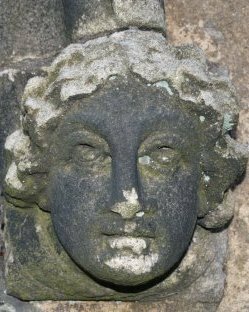 These sedimentary rock formations were formed in the carboniferous period at the bottom of these seas, covered in sediment and compressed. 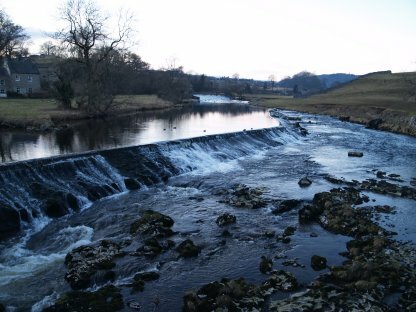 Eventually plate tectonic activity has lifted them, and surrounding land, up above sea level. 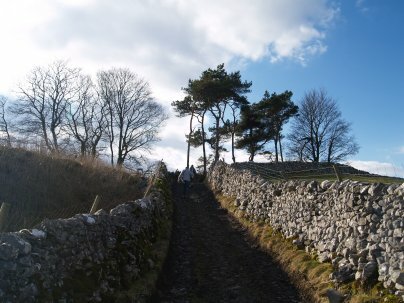 An old dry stone wall up the south side of Elbolton Hill. 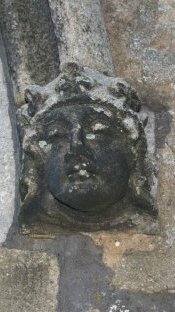 Butter Haw half covered in snow. 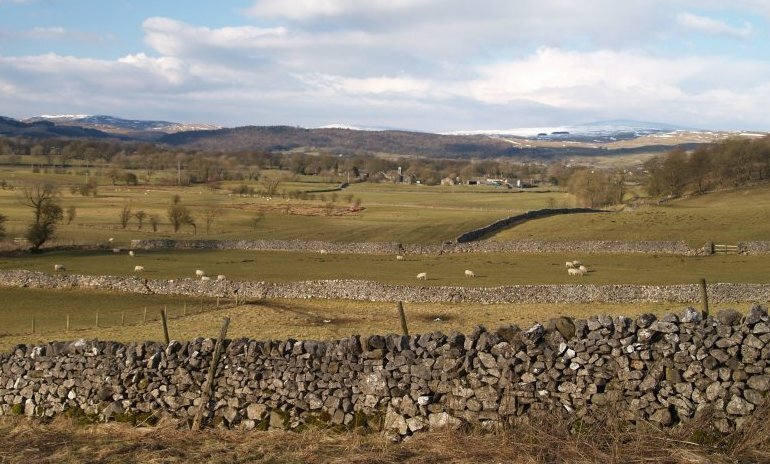 Looking north across the fields to Linton Village. 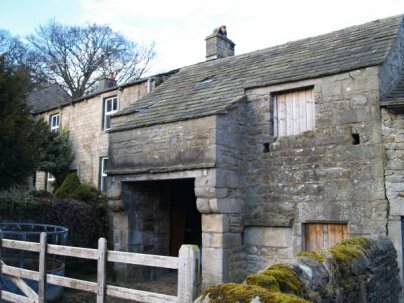 The barn just north-east of Ings House, where you turn right to cross the fields to Linton. 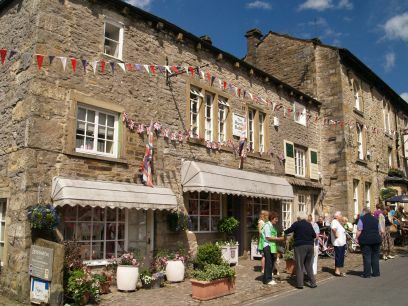 Some of the fine 18th century buildings in Linton, left the village green and right Well Lane. 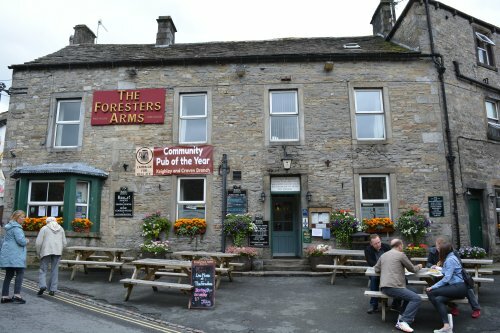 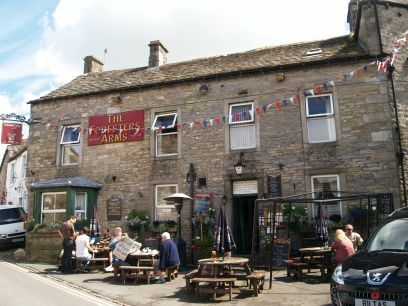 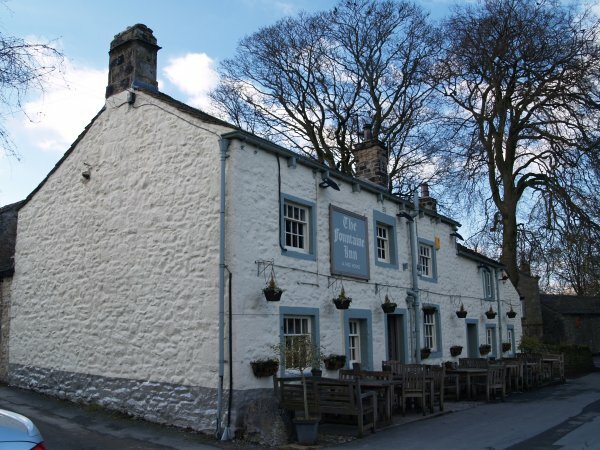 The, 'full of character' Fountaine Inn is a 17th century pub in Linton. 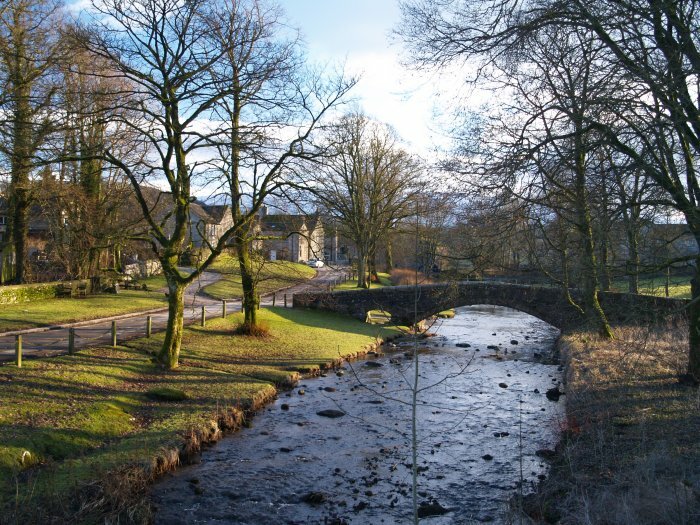 The pretty village green river scene of Linton Beck and the old medieval 14th century packhorse bridge. 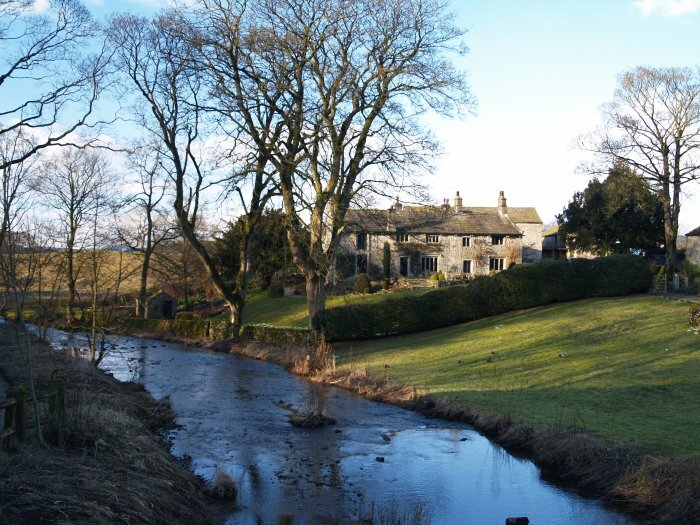 Another fine house on the banks of Linton Beck from the 1892 road bridge before heading north-east on a minor road to lovely old church described below. 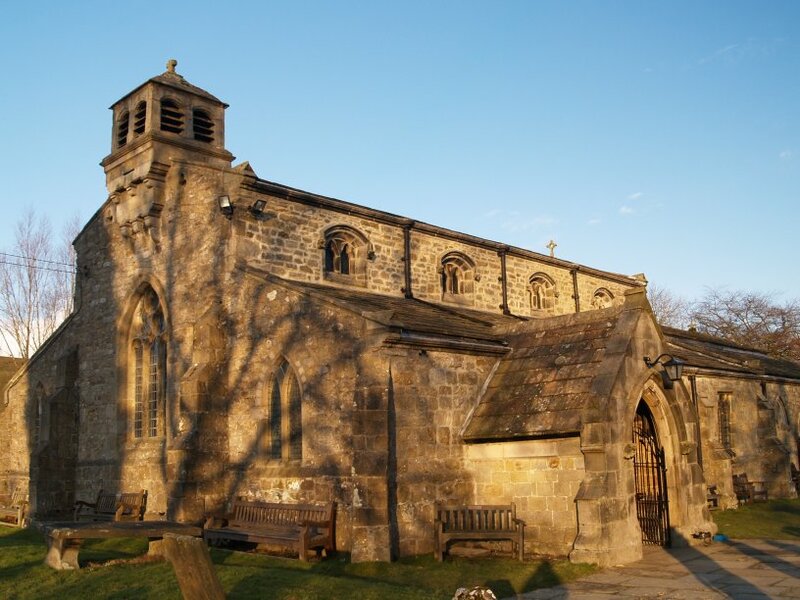 The Parish Church of St Michael and All Angels north-east of Linton village on the banks of the River Wharfe dates from ~1150 and retains some original Norman architectural features. 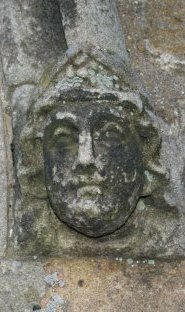 The squat square bell tower might date from the 13th century. 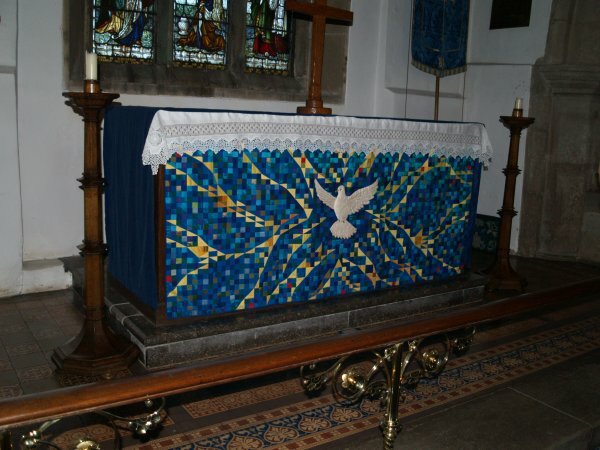 The east end of the Church of St Michael and All Angels. 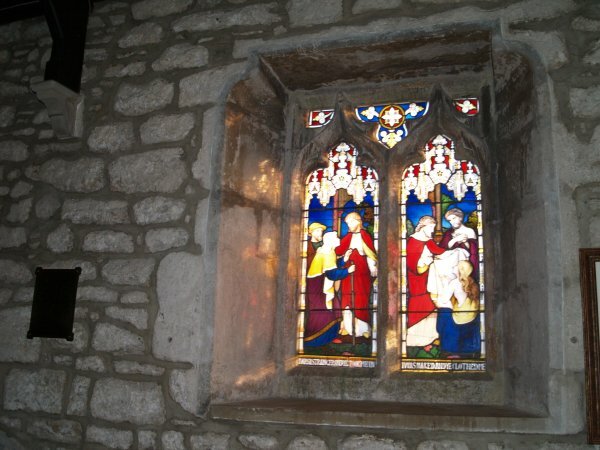 Much of the tracery of the windows is 13th-15th century, though some is restored. 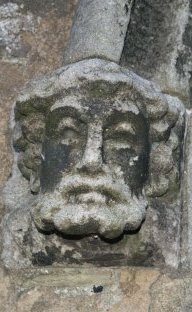 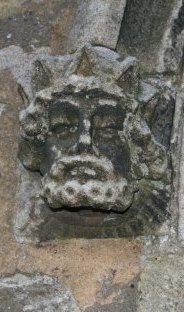 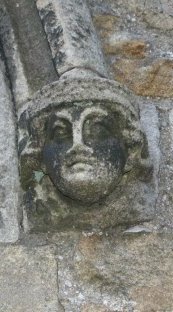 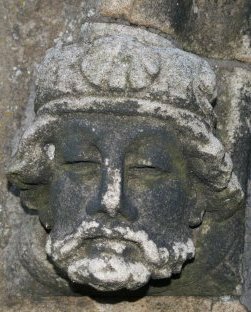 Carved heads on the exterior of the nave. 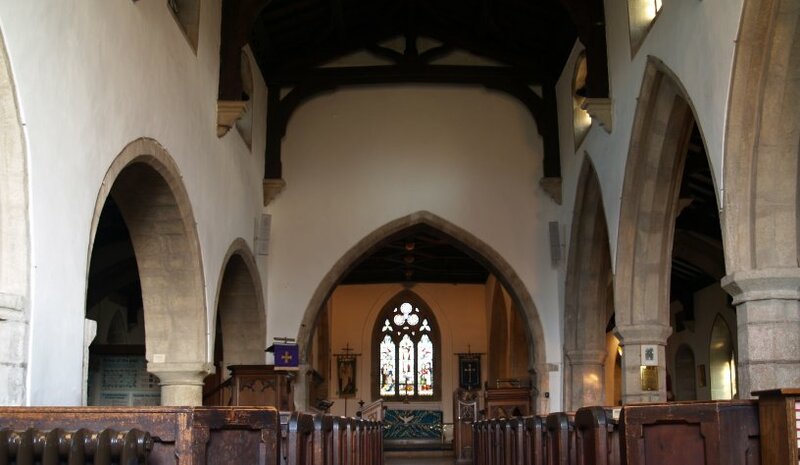 Looking down the nave to the altar and east window. 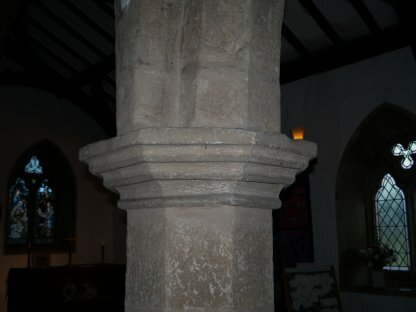 The later Norman pointed arches of the south aisle of the nave, simply carved capitals and pillar bases. 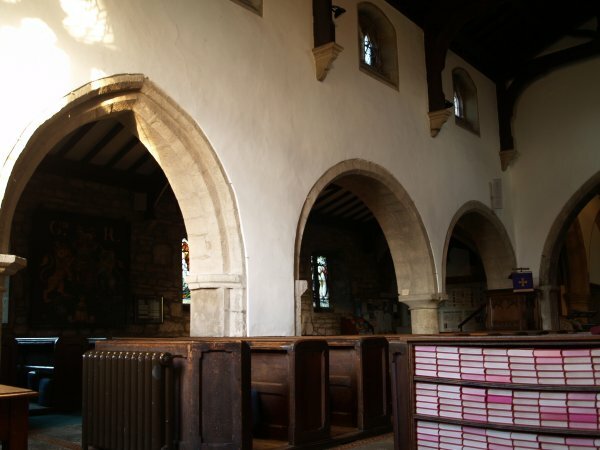 The later pointed arch and earlier Norman 'Romanesque' style curved arches of the north aisle. 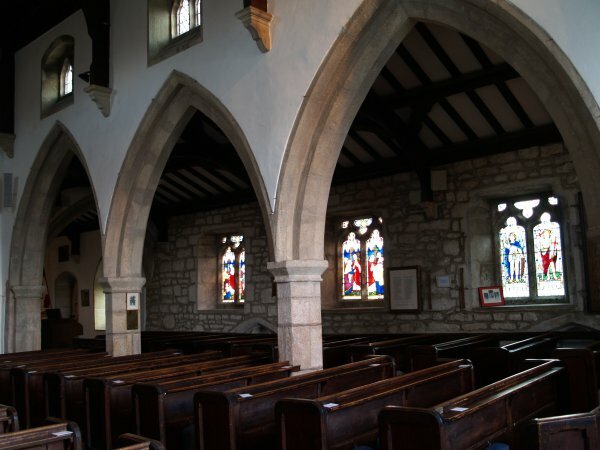 Looking down the nave to the west window. 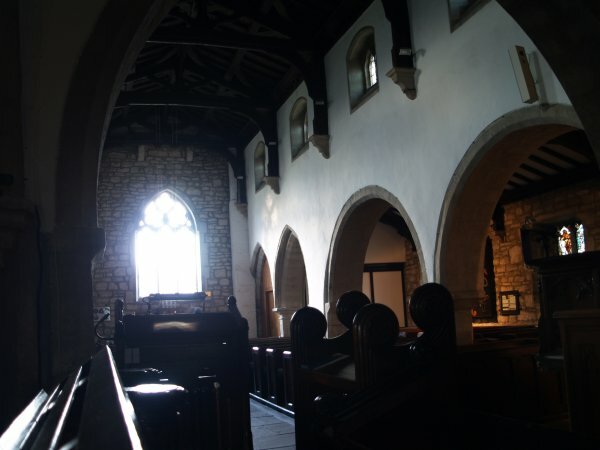 Behind the attractive cover is a carved (with crosses) medieval stone altar that escaped the architectural and aesthetic destruction of the Reformation. 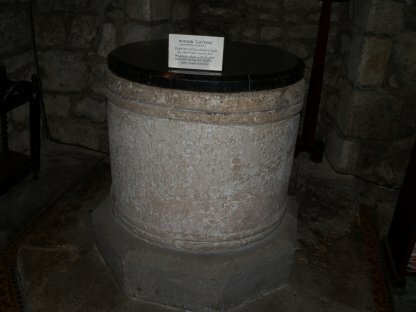 The Norman tub font and the carved capitals of the pillars of the nave. 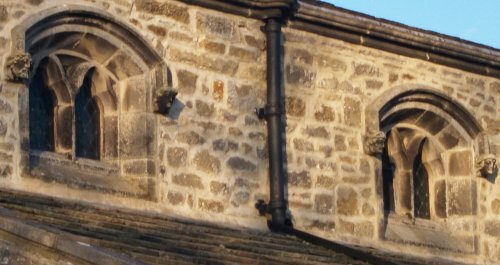 The Victorian stained glass window creates colours on the ancient stonework of the walls of the nave - the stone of the window is much older. 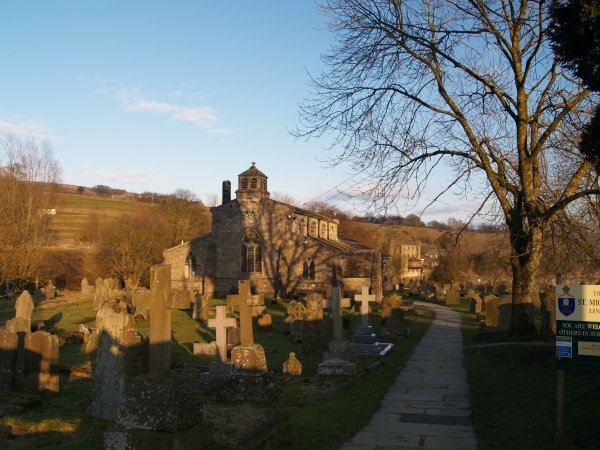 Goodbye in the winter evening sunlight. 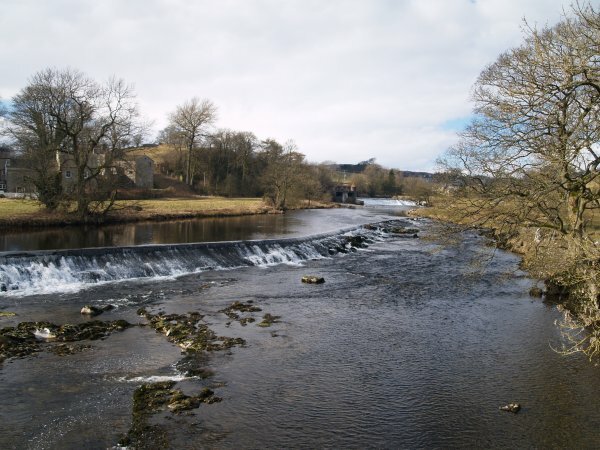 Back to Linton Falls, the weirs and footbridge back over to Grassington. 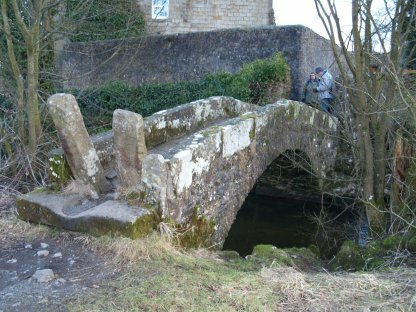 Near the footbridge is an very small old packhorse-humpback bridge (top left above) known as Li'le Emily's Bridge named after a local girl called Emily Norton mentioned in Wordsworth's poem 'The White Doe of Rylstone'. 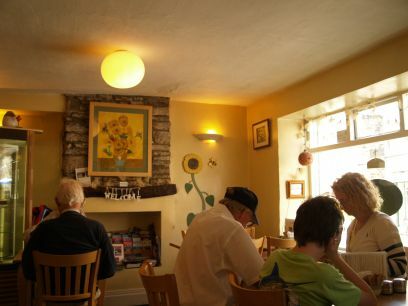 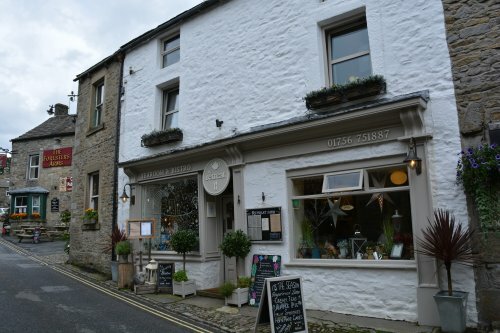 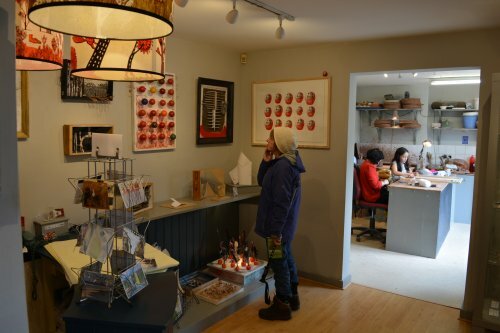 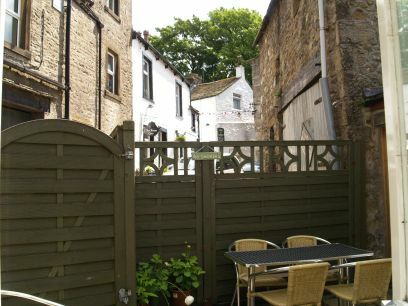 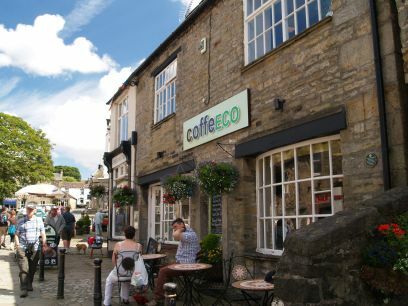 The Retreat Cafe licensed cafe, Grassington, with its nice cosy interior and a quiet area at the back.